The new Soyuz-2-1v rocket has finally made its debut launch on Saturday. The secretive launch of the new Soyuz – that does not sport any of the boosters familiar to the other members of the Soyuz family – successfully lofted the Aist satellite and two SKRL-756 calibration spheres from launch pad 43/4 at the Plesetsk Cosmodrome, with launch occurring at 12:30 UTC on Saturday. The new vehicle is a member of the Soyuz-2 family, a direct descendant of the older and wildly successful Soyuz-U family of rockets. Several variants of the Soyuz-2 family include the Soyuz-2-1a, an upgrade of the Soyuz-U with modern digital electronics and revised upper stage functions. Soyuz-2-1b replaced the upper stage with a new unit, powered by an improved avionics suite and more powerful engine. The Soyuz-ST – flown out of Kourou, French Guiana – provided a customized version of the Soyuz-2 for use by the European Space Agency (ESA). For the 2-1v, the program is making a large change, replacing the 55 year old design for the first stage and its boosters. This initiative came after successful inaugural flight of the Soyuz-2-1b in 2008, with final approval granted for what is known as the Soyuz-2-1v program. The Soyuz-2-1v marks an increase in the first stage diameter from 2 meters to 2.7 meters, and replaces the aged RD-108 with a new engine. The vehicle will carry over the control and guidance systems from the Soyuz-2-1b and will interface with the already existing ground support equipment. 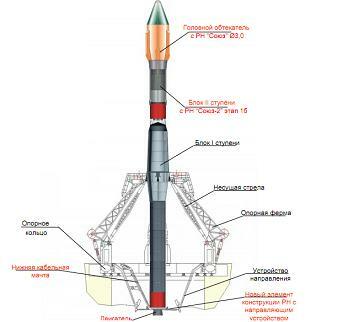 Per an array of presentations in the L2 Russian Section – L2 LINK – the vehicle stands 44 meters tall on the launch pad. Replacing the legacy R-7 first stage and boosters, the new first stage sports a replacement engine, designated as the 14D15, built by the NK Engines Company. Images of the engine show it is based on the NK-33, from Sergei Korolev’s ambitious moon rocket, the N-1. 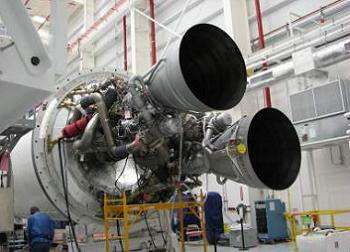 Notably, Orbital’s Antares launch vehicle also utilizes engines derived from the NK-33 – the Aerojet-supplied AJ26-62. While the Soyuz-2-1v uses one main engine – with a separate engine for vector and roll control – Orbital’s rocket utilizes two AJ-26’s together, in order to handle vector and roll control requirements. This engine’s stats include a thrust rating listed at 1,545 KN (Sea Level), 1,720 KN (Vacuum), with a Thrust Specific Impulse of 297.6s (Sea Level), 331.2s (Vacuum), with a thrust range of 55 percent to 100 percent of rating. Documentation also shows another engine on the core, the RD-0110R called the 14D24. The 14D24 handles the vector and roll controls for the first stage. The stats for this engine include a thrust rating listed at 24.28 KN (Sea Level), 27.81 KN (Vacuum), with a Thrust Specific Impulse of 260.5s (Sea Level), 298.3s (Vacuum), while the dry weight of the engine is 425 kg, compared to 1,250 kg for the 14D15. 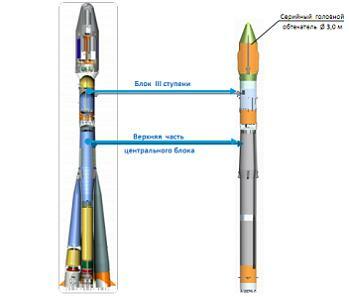 In addition, the new launch vehicle will debut with the new Volga insertion stage. Said to be cheaper than the Fregat stage currently in service, the Volga will cater for orbital insertion to orbits as high as 1700 km. Built to endure up to 24 hours of operation – with multiple restart capability – the Volga is targeted at the largest base of Fregat customers on the Soyuz, those seeking mid to high orbits. This unit has been developed internally by TsSKB, who are aiming to ensure the Volga will be compatible with the entire Soyuz-2 fleet of launch vehicles. The company predicts it could replace the more expensive Fregat on half of missions it is currently used for. 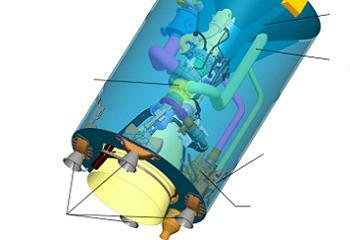 The engine details for the Volga Upper Stage have not been disclosed at this time. The most striking element for the Soyuz-2-1v is the removal of the distinctive boosters that are usually seen surrounding the core stage. However, careful examination of the booster reveals that there is still provision to add four boosters to the design as a potential upgrade path for the future. Several concepts relating of this projected upgrade have appeared over the years, but have remained on the drawing board. One such upgrade is called the Soyuz-2-3, which sports boosters using the RD-0155 engine, RD-193 engine or RD-120 engine. The design of these boosters have varied over time, but a model on display in Vienna shows a vehicle with four cylindrical boosters topped with a nose reminiscent of that found on the Energia. Further evolution is noted in the notional Soyuz-3 project, which replaces the Soyuz-2 upper stage with a new unit, based on a Hydrogen-driven – as opposed to Kerosene – Soyuz-2 upper stage, using the new RD-0146 engine co-developed with Pratt & Whitney. The first flight unit of the 1v was completed in 2012 and shipped to the launch site at Plesetsk. The first test stage of the 1v was rolled out on January 6, 2011 from the Zagorsk testing facility in Peresvet Russia, just north of Moscow. It was then used for several engine tests relating to the fuel system, tank pressure testing, etc. The first full-up firing of the complete first stage took place at the Zagorsk facility – which has been home for rocket stage testing since 1949, following the inaugural test of a Russian copy of the German V-2 rocket. 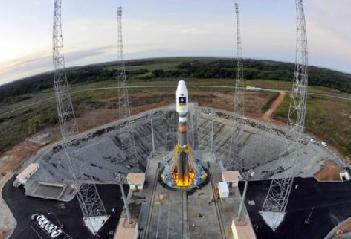 The launch of the new rocket had been delayed several times. Several scrubs were incurred during recent days, with the Russian media twice claiming the mission had been moved into 2014, including on Saturday, right up to the moment the vehicle actually launched. Little is known about the payloads that rode uphill on this debut launch, other than an Aist satellite was riding alongside two SKRL-756 calibration spheres. 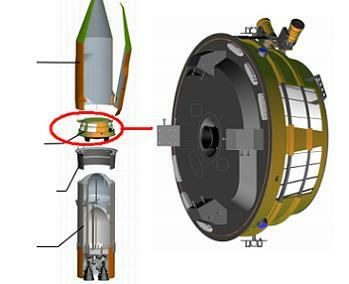 Aist – a prototype spacecraft designed by the Rocket and Space Center and Samara State Aerospace University – will be launched on top of the upper configuration, while the two spheres will be placed on either side, below the Aist spacecraft. The target orbit altitude for Aist is understood to be similar to the 575 km circular orbit of a previous Aist spacecraft launched by a Soyuz 2-1A earlier this year during the BION-M mission. Successful spacecraft separation was achieved at 14:10 UTC. (All images via L2 documentation and photo collections – Soyuz at Kourou via ESA. Vehicle on the pad via unknown source).